In an exclusive ExopoliticsTV interview with Alfred Lambremont Webre, Patricia Cori, author of Before We Leave You: Messages from the Great Whales and the Dolphin Beings, has stated that the 5-year sonar testing program announced by the U.S. Navy is having a destructive effect far beyond what the conventional analysis and media are reporting. The environmental impacts of the U.S. Navy sonar-testing program include the estimated annihilation of 13 million sea mammals, including cetaceans such as dolphins and whales. According to Ms. Cori, the cetaceans being targeted by the U.S. Navy sonar program carry out an important role in maintaining the frequency of vibration of the Earth’s oceans and hence of the planet itself. Ms. Cori demonstrated a series of mandala frequency patterns generated from the sound music produce by dolphins and whales by scientist Mark Fisher. It is this cetacean sound music that, according to Ms. Cori, in turn has a frequency effect on the ocean waters, lifting it to higher vibrations. 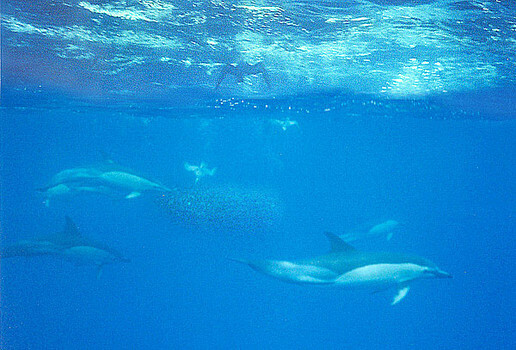 Intelligence, Ms. Cori states, is associated with higher vibrational fields, and hence the cetaceans are performing a function of sustaining higher intelligence in the natural ecology. The effects of the U.S. Navy sonar targeting, which may be far beyond weapons testing into operational targeting and genocide of cetaceans, is to lower the vibrational field of the Earth and slow its elevation and transition into a more evolved dimension. Patricia Cori’s statements are also congruent with those of researcher Rosalind Peterson, who is actively concerned about the impact of the U.S. Navy’s sonar program on cetaceans. Rosalind Peterson states, “The United States Navy will be decimating millions of marine mammals and other aquatic life, each year, for the next five years, under their Warfare Testing Range Complex Expansions in the Atlantic, Pacific, and the Gulf of Mexico. The National Marine Fisheries Service (NMFS under NOAA), has already approved the “taking” of marine mammals in more than a dozen Navy Range Warfare Testing Complexes, and is preparing to issue another permit for 11.7 millions marine mammals (32 Separate Species), to be decimated along the Northern, California, Oregon and Washington areas of the Pacific Ocean. “U.S. Department of Commerce – NOAA (NMFS) Definition: ‘TAKE’ Defined under the MMPA as ‘harass, hunt, capture, kill or collect, or attempt to harass, hunt, capture, kill or collect.’ Defined under the ESA as ‘to harass, harm, pursue, hunt, shoot, wound, kill, trap, capture, or collect, or to attempt to engage in any such conduct.’ Definition: Incidental Taking: An unintentional, but not unexpected taking. “The total number of marine mammals that will be decimated in the Atlantic, Pacific and the Gulf of Mexico for the next five years is unknown. The NMFS approvals will have a devastating impact upon the marine mammal populations worldwide and this last Navy permit, which is expected to be issued in February 2010, for the “taking” of more than 11.7 million marine mammals in the Pacific will be the final nail in the coffin for any healthy populations of sea life to survive. “Now with ever-increasing numbers of permits being issued for sonar programs in more than twelve ranges in the Pacific, Gulf of Mexico, and the Atlantic regions of the United States, our marine mammals and other sea life are facing complete devastation. When you add bomb blasts to this list, warfare testing of all types, future war testing practice, and the toxic chemicals that are both airborne and to be used underwater, there is little chance that most marine life will survive in any significant numbers. Our U.S. Senators and U.S. Congressmen refuse to postpone these disastrous “takings” or hold U.S. Congressional Hearings while pretending to be ocean environment friendly in their re-election speeches. “[During] June 8th through June 16, 2009, a delegation from Connecticut and California spent time walking the halls of the U.S. Senate and U.S. House of Representatives. We left petitions, color fliers, and information about saving our marine mammals, requested a postponement and U.S. Congressional Hearings. Ninety-nine senate offices were visited and 2/3 of offices in the U.S. House of Representatives. The silent response from our elected officials regarding these two requests has been zero…one U.S. Congressman even stated that citizens would be ‘laughed out of the halls of the U.S. Congress for suggesting that we protect our marine mammals’. Corporate paid ‘Lobbyists’, who hand out money by the $Millions, on the other hand, are always accepted at hearings, give testimony, and are welcomed in the halls of Congress…apparently the voices of citizens of the United States are not given the same status. “These virtually unregulated Navy Warfare Testing Programs already approved are now taking a toll on marine mammals, the fishing and ocean tourism industries, and on all aquatic life. Many U.S. Senators and Congressmen are ignoring these issues by pretending that they doesn’t exist even though they have been informed in advance of these programs. “A brief history of the Navy Warfare Testing Program is needed to understand the full implications of this Pentagon/Navy Warfare Testing Program. In 2004, the Bush Administration signed a bill weakening U.S. Environmental Laws, with regard to the U.S. Navy. And then in 2008, President Bush signed an executive order allowing the Navy to be exempt from environmental laws that protects endangered and threatened species (2-4). The Navy Southern California Complex was the first one to benefit from this executive order. Soon other Navy Range Complexes were obtaining exemptions from the NMFS with little or no oversight or significant mitigation measures. “A partial listing of known Navy Range Complexes shows the amazing scope of the disaster. According to U.S. Congressman Waxman in a letter dated March 12, 2009: ‘…The Navy estimates that its sonar training activities will ‘take’ marine mammals more than 11.7 million times over the course of a five-year permit…The sonar exercises at issue would take place off the Atlantic and Pacific coasts, Hawaii, Alaska and in the Gulf of Mexico – affecting literally every coastal state. In many regions, the Navy plans to increase the number of training exercises or expand the areas in which they may occur. Of particular concern are biologically sensitive marine habitats off our coasts, such as National Marine Sanctuary and other breeding habitats…In all, the Navy anticipates that its sonar exercises will ‘take’ marine mammals more than 2.3 million times per year, or 11.7 million times over the course of a 5-year permit….’ This statement was made in response to public inquiries regarding the Navy Northwest Training Range schedule for Northern California, Oregon, Washington, and Idaho. “KTVU Oakland San Francisco Television Station is the only television station to investigate and air a story about this U.S. Navy program (13), on May 18, 2009. It took a great deal of courage, in the face of the fact that no other major television networks would carry this story. A few courageous radio stations are also helping to get the word out to the public. “The ‘taking’ of marine mammals negatively impacts the entire ecology of our oceans and the life in them which feeds large numbers of people and other species around the world. It should be noted that the list of toxic chemicals that the Navy proposes to use is a long one as noted in the Navy E.I.S. Depleted uranium, red and white phosphorus, mercury, lead, and a whole host of chemicals known to be toxic not only to man, but to marine life, are being served up on the “Navy Warfare Chemical Menu” that will contaminate our air, water, and soil. In the ExopoliticsTV interview, Ms. Cori and Mr. Webre discuss whether the U.S. Navy are acting as surrogates in a covert attempted occupation by planet Earth by Orion grey extraterrestrials and Draco reptilians. By targeting the most evolved mammalian intelligent species on the planet, the cetacean dolphin and whales, the U.S. Navy appears to be acting to reduce the vibratory frequency to Earth to make it a more hospitable ecology as a reptilian-based planet, hosting cloned or mind-controlled humans in a world authoritarian-like dictatorship. As this column has reported, “Michael Prince, an active duty whistleblower trained to be a cyborg super soldier assassin in SS and MI-6 U.K. intelligence networks, has stated that World War III, a war between hostile extraterrestrial civilizations and the human civilization has started. Armed hostilities between human forces and hostile extraterrestrial forces are now taking place frequently, Mr. Prince states. The negative extraterrestrial-human alliance intent on Earth take-over is referred to as the Military Industrial Extraterrestrial Complex [MIEC]. As discussed in the ExopoliticsTV interview with Patricia Cori, it appears that the U.S. Navy sonar-testing program is in fact an operational combat attack program against cetaceans on behalf of the U.S. Navy exopolitical masters, the Orion grey and Draco reptilian extraterrestrials. According to Ms. Cori, there are cetacean representatives on the Sirian High council, a galactic governance body. The cetaceans on Earth, whales and dolphins, are in fact the most intelligent and multi-dimensional species on surface of the planet, and work in close coordination with upper-dimensional, ethical intelligent civilizations that have an oversight and seminal role in the development of homo sapiens and of the fauna and flora of the ecology of Earth. The dolphins and whales themselves, Ms. Cori states, communicate with humans and state that they are in communication with advanced extraterrestrial species. For example, it has been reported that whales and dolphins are teleported by extraterrestrial craft up from the ocean onto ET craft, where they are held in special pens, and downloaded with ecological and multi-dimensional information via multi-colored lights before being returned again into the ocean to complete their ecological missions. The impetus for Patricia Cori’s book – Before We Leave You – began with spontaneous dimensional communications from cetaceans in distress because of targeting by U.S. Navy sonar. Ms. Cori indicates she has written her book as a communication from the cetacean conscious community – the cetacean nation – to conscious progressive humans to become aware of the attack upon them and upon the oceans of the world, and hence upon the very ecology of the Earth. In the course of the ExopoliticsTV interview, Patricia Cori indicated she is starting a Foundation to support cetacean awareness, and will be inviting cetacean activists like Rosalind Peterson into dialogue.